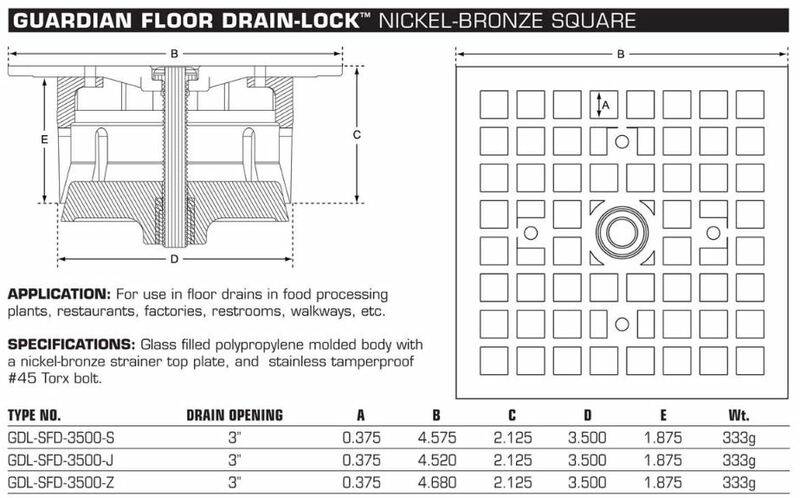 The Guardian FLOOR Drain-Lock replaces old, broken, or stolen drain grates with an identical drain cover that features our patented locking system. Your typical drain cover can easily be removed with a screw driver, but this Drain-Lock requires a unique tool so that only the appropriate staff can remove the cover and access your facility drains. Perfect for floor drains in restaurants, food processing plants, factories, restrooms, walkways, and construction sites. Replaces 3” floor drains covers manufactured by Josam, JR Smith, and Zurn. Please choose the correct drain style. For other sizes consider our Lock and Stop Drain Lock.